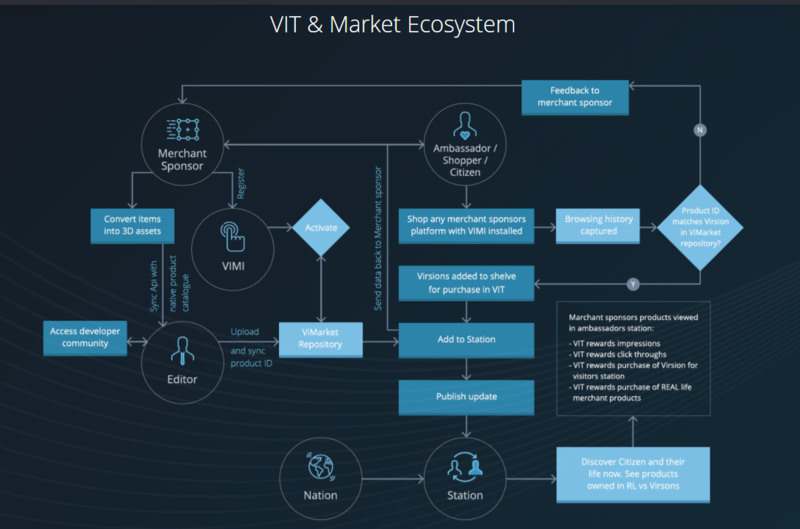 ViMarket UK Ltd is a virtual advertising and shopping platform that allows users to use virtual reality to simulate real-life purchases in order to improve their confidence in potential purchases. The basic concept is that the ViMarket Platform will provide the user with the technology to create a virtual 360° representation of their real-life room. Once this is done, the user can view their space with VR glasses that are connected to the ViMarket platform. The ViMarket platform will then allow users to download 3D furniture and other digital representations of items that they have for sale and apply them to their digital space. This will allow users to browse and experiment with new décor ideas in a safe to-scale way that would entail far less time and effort than with traditional means, as the users will not need to measure their living space and furniture, carry color swatches, and guestimate whether an item would truly go with the room. If they like it, then they can buy it. The best part is that this shopping will take place in the comfort of their own home, through any VR deceive that the user has downloaded the necessary software onto. 3D content creators who would otherwise be unable to showcase their design concepts will now be able to offer their content on a global interface to Merchant Sponsors. While both consumers and Market Sponsors can view their content, their products will not be made available for purchase unless a Merchant Sponsor guarantees their production. Merchant Sponsors will have the opportunity to access to a greater variety of designers, as well as a larger consumer audience. They will also be able to assess user interest and track follow through rates of consumer purchase. They can also increase user interest by offering discounts for purchases transacted through the platform. ViMarket also hopes to decrease shopping cart abandonment by allowing users to store the 3D renders of their redecorated rooms on their nation app, thereby lowering the possibility of consumers forgetting their interest in the Merchant Sponsors product. Users will also be notified when products on their wish-list are being offered for a reduced price. Consumers will be able to review products on a 3D interface and apply it to a 3D representation of their real space via ViMarket’s Citizens Station, thereby making shopping choices easier. This can be done through the installation of software onto a range of VR devices. However, use will need to purchase virtual representations of products that they wish to review on the station. Customers will also be able to try out items from various vendors at the same time, thereby allowing them to have an overall view of how their potential purchases would look in combination. If they purchase the virtual version of the product, the users will receive discounts for completing a purchase of the real product through the platform. Consumers can also use their friends’ and families’ wish-lists to buy them gifts. VIT are ERC20 compatible tokens based on the Ethereum blockchain. They are required to access and perform transactions on the ViMarket Platform and can be used to purchase both real and virtual goods. Users will receive VIT for viewing products and through clicking through to a Merchant Sponsor’s platform. These tokens also have potential for other reward mechanisms, such as reviews. The use of cryptocurrencies as a mode of exchange on the ViMarket platform, will allow for various global market actors to engage with each other and transact, regardless of border constraints, via a method that is transparent and tracable.